Dhaka, Oct 18 (Just News): Newly formed Jatiya Oikya Front leader Kamal Hossain on Thursday briefed foreign diplomats stationed in Dhaka about their demands, goals and position on the next general election. Initially, BNP secretary general Mirza Fakhrul Islam Alamgir welcomed the diplomats and introduced the Oikya Front leaders at a city hotel. Later, Kamal Hossain read out a written copy of their party's seven-point demand and 11 objectives, and then replied to different questions by the diplomats. 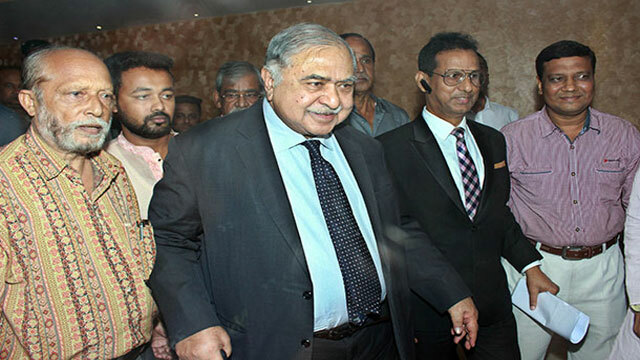 Talking to newsmen, BNP standing committee member Abdul Moyeen Khan said Kamal Hossain told the diplomats that their alliance wants to restore democracy and voting rights, and ensure a fair and credible election so that people get a chance to elect their representatives as per their choice. BNP standing committee member Moudud Ahmed said Kamal Hossain informed the foreign envoys about their alliance's demands and goals and replied to their questions. Jatiya Samajtantrik Dal (JSD) president ASM Abdur Rob said, "We exchanged views with the diplomats of different countries. Our top leader Kamal Hossain explained our demands and goals, and cleared our position on the next election." BNP organising secretary Shama Obaid said diplomats from around 25 countries, including the USA, the UK, EU, Canada, India, Pakistan, China, Japan, France, Germany, Switzerland, Denmark, Greece, Turkey, Vietnam and Norway joined the briefing. A Gano Forum leader, who was present at the meeting, wishing anonymity, said Kamal Hossain told the diplomats that their alliance wants the government to ensure a level-playing field and congenial atmosphere for holding the next election with the participation of all parties. As a diplomat wanted to know the name of chief of the Oikya Front, the noted jurist said their alliance is run by a joint leadership. Asked whether the party will join the polls if BNP chairperson Begum Khaleda Zia is not freed from jail, Kamal Hossain said they want all political prisoners to be released before the announcement of the election schedule for holding the election in a credible and acceptable manner, the Gano Forum leader added. Apart from Kamal and Fakhrul, BNP standing committee members Khandaker Mosharraf Hossain, Moudud Ahmed, Jamiruddin Sircar, Rafiqul Islam Mia, Abdul Moyeen Khan, Mirza Abbas, Nazrul Islam Khan, Amir Khosru Mahmud Chowdhury, JSD present ASM Abdur Rob, vice president Tania Rob, general secretary Abdul Malek Ratan, Nagorik Oikya convener Mahmudur Rahman Manna, Gano Forum executive president Subrata Chowdhury, general secretary Mostafa Mohsin Montu, Zafrullah Chowdhury, former adviser to the army-backed caretaker government Mainul Husein and former vice president of Dhaka University Central Students' Union (Ducsu) Sultan Mohammad Mansur Ahmed were present . Earlier on Tuesday, the Oikya Front leaders at a meeting at JSD president ASM Abdur Rob's Uttara residence decided to hold a rally in Sylhet on 23 October. On 13 October, BNP together with Kamal-led Jatiya Oikya Prokriya, JSD and Nagorik Oikya launched the Jatiy Oikya Front to press for their seven-point demand, including holding the next polls under a non-party administration.